The Sacred Valley tour is the most popular tour in Cusco because of the amazing Inca sites that are found through out a very scenic valley. 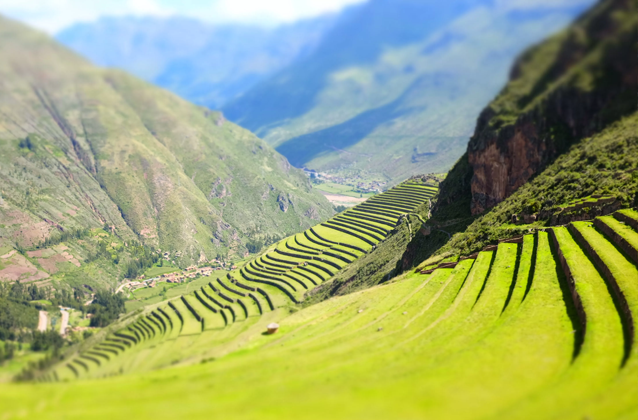 On this Sacred Valley tour, you will visit 3 main Inca sites: Pisac, Ollantaytambo and Chincheros. We will pick you up at approximately 07:30am from your hotel in Cuzco. Our first stop is the mirador of Taray where you will have a chance to take pictures of the impressive Sacred Valley. Then we will stop at the Pisac local market where you can buy genuine local artisan-crafted souvenirs. Your guide will then take you on a hike to explore the extensive ruins of Pisac. During the hike, you can take pictures of the stunning views of the valley. On the guided tour of the Citadel of Pisac you can observe temples, residences, altars, channels, carvings, tunnels, caves and the famous Intihuatana or “The hitching post of the Sun"
After Pisac, we stop at Urubamba for a delicious lunch before visiting the impressive Citadel of Ollantaytambo. Here you will again discover the magnificence of the Inca constructions, the amazing temple of the Sun, enormous blocks of rock perfectly carved and polished, stone water fountains, stairs, terraces and the beauty of the local people in their traditional attire, all surrounded by the sacred mountains and valley of Patacancha and Willoq. The Sacred Valley tour is rated EASY. However, it is important to feel comfortable walking for extended periods of time 20 minutes at a time approximately. The Sacred Valley tour departs daily and it is available year round. The months of January, February and March are in the wet season, please bring a good rain jacket and waterproof your belongings. The Sacred Valley tour can be canceled with 48 hours notice and a $10 usd per person cancellation fee.